A Fangame Engine is the base code that can be used to create other fangames. The term often gets confused with "Game Engine", which refers to the program the Fangame Engines were made in, such as Game Maker and Unity. Fangame Engines can be seen in a fairly isolated form as howtos. 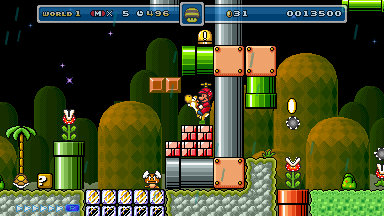 Mario Engines usually expected to contain features normally seen in the official games, such as Mario like physics, collision checking, Question Mark Blocks, and enemies. It is common to see other features implemented to help make the game feel more unique. Open-source engines allow inexperienced or non-programmers to easily create their own games. In many cases, the engines are barely modified, if at all. Bugs, annoyances, and a general "cookie-cutter" feel sometimes persist with games produced with these engines. These engines are often cited as being overused and generally unchanged. Hello Mario Engine is an example of a Fangame Engine. Hello's "Hello Mario Engine Legacy"
Hello's "Open Source SMB1 Engine"
Gatete's "Gatete Mario Engine 8"
djrellik's "Mario Bros. 3 Engine"
Supernova's "Supernova Mario World Engine"
Retriever II's "High Precision Movement Engine"
Soniro's "Open Source Mario Engine"
This page was last edited on 29 June 2017, at 19:02.